Recently the president of Mexico Enrique Peña Nieto has tried to defend his reputation and legacy. But, like Donald Trump, he is trying to create an alternative reality that doesn't fit the facts. The presidents of Mexico and the United States must think that everyone is ignorant, or that we dont read the news. They also seem to think that if they keep repeating their lies over and over again, we will just start to believe them. Both are fond of crafting completely different versions of reality in order to preserve their reputations and raise their job-approval poll numbers. But neither leader realizes that their clumsy, ineffective communication strategies make them come across as demagogues in our modern age, in which everything is eventually known, and nothing can be hidden from social media. After President Andrés Manuel López Obradors election victory in Mexico in July, President Enrique Peña Nieto virtually disappeared while the president-elect, hastily, and with a clear sense of urgency, dominated the headlines. But recently Peña Nieto has re-emerged in interviews and promotional videos trying to defend his reputation and legacy. His efforts have not been entirely fruitful. For instance, he has tried to distance himself from the so-called white house affair, but the scandal will likely haunt Peña Nieto for the rest of his days. In a recent TV interview with the journalist Denise Maerker, the current Mexican president tried to reverse his earlier assertions that a $7 million home purchased from a government contractor was owned solely by his wife. In the interview, he recognized that he too had been involved. As any married couple, we were buying a new house, he admitted. Then, instead of expressing regret that he had been involved in a transaction that was obviously a conflict of interest, he said he merely regretted the way the fallout was handled. I regret having involved my wife in explaining the issue, Peña Nieto said. Additionally, his explanation concerning the 43 missing college students from Ayotzinapa, who no one has heard from since 2014, doesnt add up either. Instead of calling for an independent investigation or commission to investigate the affair, Peña Nieto, in an official video message, recently insisted on endorsing a story that the students were killed solely by a group of delinquents in the state of Guerrero, who later incinerated their bodies. Relatives of the students and many investigators have rejected this implausible version of the truth. This - and the more than 100,000 Mexican deaths due to violence - will be seen as the ultimate failure of Peña Nietos six-year presidential term. Peña Nietos fearful and submissive attitude toward President Donald Trump will be part of his legacy as well. When Trump visited Mexico City, Peña Nietos inability to tell him that Mexico would not be paying for a border wall, a point Trump has insisted on for years, was deeply disconcerting. Nowadays Peña Nieto wants to put a positive spin on that disastrous meeting. His new version, which he explained on Twitter, is that the indignity eventually led to something positive: the signing of a new trade agreement with the United States. Trump, of course, is also adept at trying to put a spin on everything. Last week, researchers from George Washington University estimated that 2,975 people had died in Puerto Rico in the aftermath of Hurricane Maria, a figure that differs drastically from the official tally of 64 deaths. But instead of acknowledging his administrations failure to adequately manage the crisis, which likely caused many of the casualties, Trump remains stuck in his alternative reality. I think we did a fantastic job in Puerto Rico, he said at the White House. But Puerto Ricans will never forget the images of Trump tossing paper towels out at hurricane survivors in San Juan, nor will they forget that he wasnt helping them when they needed it most. How can the handling of a tragedy in which almost 3,000 people died be described as a fantastic job? How can any positive spin be put on a presidential tenure during which 100,000 Mexicans died violent deaths? 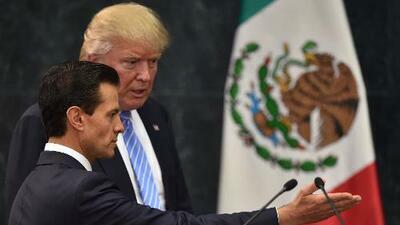 Trump and Peña Nieto want to live in a reality where neither data nor numbers matter. All that matters is their distorted view of facts. They share a simplistic understanding of the world, in which there is no problem that a good public relations campaign cant resolve. That is how they managed to take office, and that is how they will leave: messing with the message.